You don’t have to be depressed about your tiny kitchen. You really can make your small kitchen both functional and pleasing to the eye. In addition, with careful planning and thinking outside the box, so to speak, you can make your small kitchen seem much larger once you know how. Take a look at your space and decide if there is anything that can be eliminated. For instance, if you have a large refrigerator, can it be moved into an adjoining room or would the addition of a smal…. The authentic Mexican hammered copper sinks are all made of just one piece of a previously cut copper plate that is patiently hammered and heated in a wood fire until the desired shape is obtained and a brand new piece of copper art is out of the shop. But there is one more process that has to be applied to the copper sinks prior to its exhibition and sale in the market. The sinks are “patinated” so the surface will be protected against the elements, giving copper sinks its characteristic look.Many people asks about how to take care of these beautiful sinks, and many times they think it can be a daunting task, but that thought is too far from reality. Caring for these copper bowls is surprisingly easy and they are virtually maintenance free. First of all a copper finish is a living finish and it never really stops changing in color. But the evolution of a copper finish is very slow and gradual thanks to the “patina”, and as it slowly ages your sink will become even more handsome and unique.For basic cleaning simply use a mild soap and water – other cleaners are not necessary, and gently clean the surface with a sponge or soft fabric. That’s all you need to do in order to keep your sink in good shape. Unless you want to maintain a shiny copper finish, do not use copper cleaners. Also do not use abrasive materials or harsh chemicals as chlorine or vinegar on any of these copper sinks because these chemicals can harm the surface of your sink.In short you don’t need much care to enjoy the living qualities of your beautiful hand hammered copper sink; a unique and functional work of art for your kitchen of bathroom. If you are really serious about buying Copper sinks,then there are definitely a few things you should know before making any final decision. Now starting with your budget, when you do a thorough shopping research for buying the copper sink, you will be surprised to see the wide range of prices in Copper sinks. A quick research on the internet will show you the copper sink range from $200 to as close as $3000. Cost savings is the purpose of most people in the country now. They prefer going for a cheap copper sink while shopping rather than choosing the expensive one. However you get the quality for what you pay. There are a certain things that people should definitely bear in mind while buying cheap copper sinks. The construction and welding on the copper sink should be carefully seen. May be it is not the most important thing to be careful about, but is one of the concerns. Make sure that you make the copper sink as per your size specifications to avoid any future problems. Copper as a material has been in demand forever and many people have been using it as the base material for building kitchen sinks or as pots and pans. The benefits of using the copper sinks are it is stylish and nearly matches any colour that your kitchen might have. It will be available in hundreds of sizes and shapes and you can very well build them according to your requirements. It is highly resistant to bacteria and the ability to quickly heal itself. However the disadvantages follow everywhere. It is expensive for people who can’t afford one. It is more prone to scratches and there needs more maintenance that any other material. Copper farm sinks would be available in the variety of range, helping you to choose the right colour and size based on the decoration of your cabinets. Coming up with unique touches to add to your home can often be difficult as well as costly. Not to mention ensuring that the ‘unique factor’ doesn’t deplete the functionality of your home is often difficult. Fortunately, MexicanCopper.Com makes this easy by offering a beautiful handmade line of Copper sinks that are an easy and distinguished addition to any home. 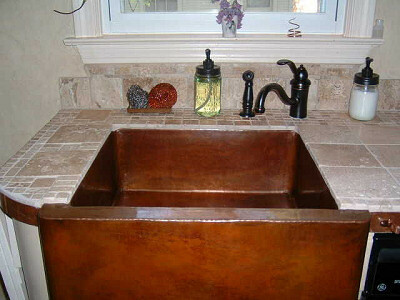 MexicanCopper.Com offers customer made Copper sinks that offer practicality and beautiful designs. These sinks can easily fit in with the décor in your kitchen, bathroom, farmhouse, or even your home’s bar area. Every sink is custom built and handmade by one of their talented artisans, ensuring that the sink you purchase is unique and durable. Besides already having a line of designs available, you can also work with MexicanCopper.Com to custom design a sink that achieves the look you desire. MexicanCopper.Com has also recently released a press release announcing that they are adding exciting new designs to their collection in 2011 which will include wrought iron accents, copper rings, rivets, and dark brown copper and nickel plated finishes. They truly have something for everyone!When you choose to do business with MexicanCopper.Com you will be working with a family owned and operated company that has specialized in hand hammering copper vessel sinks for generations. They founded their business nearly ten years ago and set up two workshops. Within no time they began to attract the attention of local consumers and talented artisans and copper smiths in their country. Since then, MexicanCopper.Com has established a name for themselves by delivering high quality, unique, durable, and gorgeous copper sinks available through their website and built by a handful of talented artisans whose families have been working with copper for generations. The aesthetically pleasing looks of a Mexican copper sink are enjoying something of a renaissance in present times. This style of sink has been around for centuries but its appeal is in its timelessness. They are truly unique looking and are akin to having a piece of working art suspended in your kitchen or bathroom! Copper kitchen sinks add a touch of class to both a vintage or a modern kitchen as they seem aged but at the same time ageless. A lot of the attractiveness is due to the unique visuals of copper and yet what most folks do not appreciate is that there are also some functional facets of owning a copper sink. As copper itself is an antimicrobial surface, a sink made with this component is unique in that it is both germ free and and has the ability to naturally heal itself. The benefit to the owner is a germ-free kitchen for ones family, which in turn, minimizes the risks of diseases and illnesses inside the household. Probably the most important thing you need to contemplate when getting a sink made of copper will be the quality within the copper itself. When purchasing a sink made of copper always make a point of shopping in person. With an popular product markets become awash with inferior imported knockoffs. Sinks making use of inferior materials are tough to maintain as low-quality sinks of copper will stain very easily thus making a potential show-piece actually end up ruining the whole appearance of your kitchen.